1 Great Ocean Road, Apollo Bay. 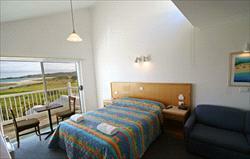 Located within walking distance of Apollo Bay's many activities and facilities. Apollo Bay is the proven getaway destination for a relaxed family holiday, with visitors returning all year round to enjoy this region's unique attractions. Nestled in the rolling foothills of the Otways ranges, Apollo Bay is positioned perfectly as a launching pad for the Twelve Apostles and many other activities the region has to offer, whilst being only 2 3/4 Hours from Melbourne. 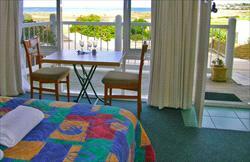 The Great Ocean View Motel offers the unique attraction of ocean views from every suite. Family Suite - has Queen Bed in Living Area and two singles in bedroom.